If I ever happen to be imprisoned for any reason in the near future, please let jail be like The Great Escape in Salem, Mass. This new eatery, which opened its doors in September 2010, gives Italian favorites a spectacular pardon. Now through April 14, it’s Salem Restaurant Week. Participating restaurants like The Great Escape are offering three-course, prix-fixe meals for only $25. Some also have a two-course option for just $15. 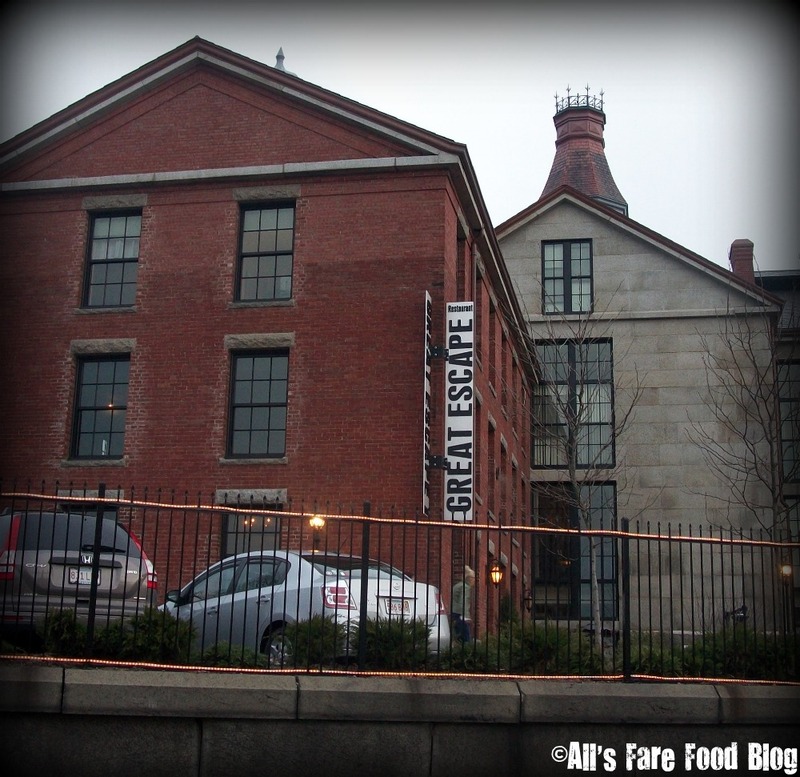 Who can beat those prices…and you get top notch cuisine in historic Salem. The Great Escape is housed in what was once the country’s oldest active jail – built in 1813 and operating until 1991, a portion of the old building has been converted into apartment units (not sure if I’d want to live there.) 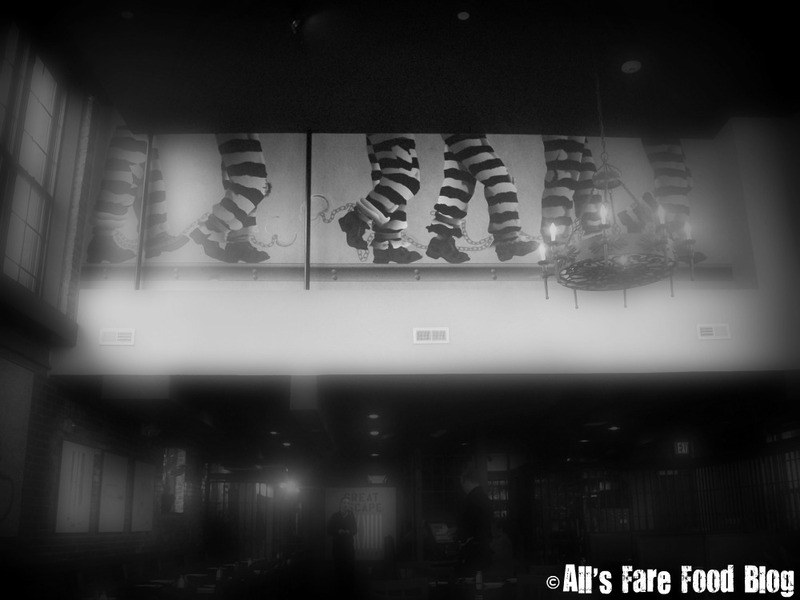 And, while I’m sure there are some grisly stories from inmates’ stays in the jail, according to our waiter – Matthew – some of the restaurant’s staff do believe the building to be haunted. However, he doesn’t believe in those things. The building is old brick and sits on the corner of Saint Peter Street and Bridge Street, right across from the Salem Depot Commuter Rail Station. Parking is the biggest issue in getting to the restaurant. We happened to find a short-term lot a block away behind the court house. But, with a lack of parking and rainy weather, the crowds weren’t piling into the restaurant – even with a cost-effective deal like Restaurant Week. The interior decor builds upon the red brick building. The tables are simple black. 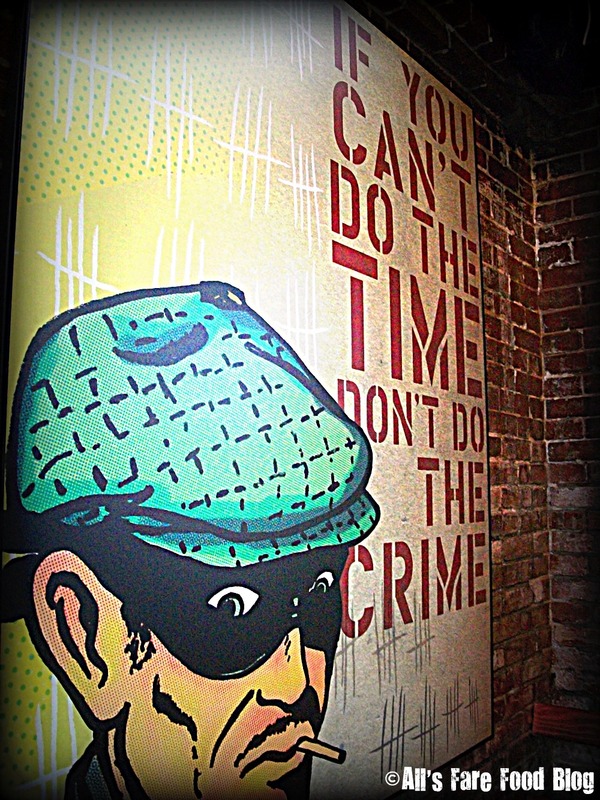 Black, iron bars line the walls with subtle pop icon-esque pieces of jailbird artwork. I felt remiss without my orange jumpsuit or a mug shot. 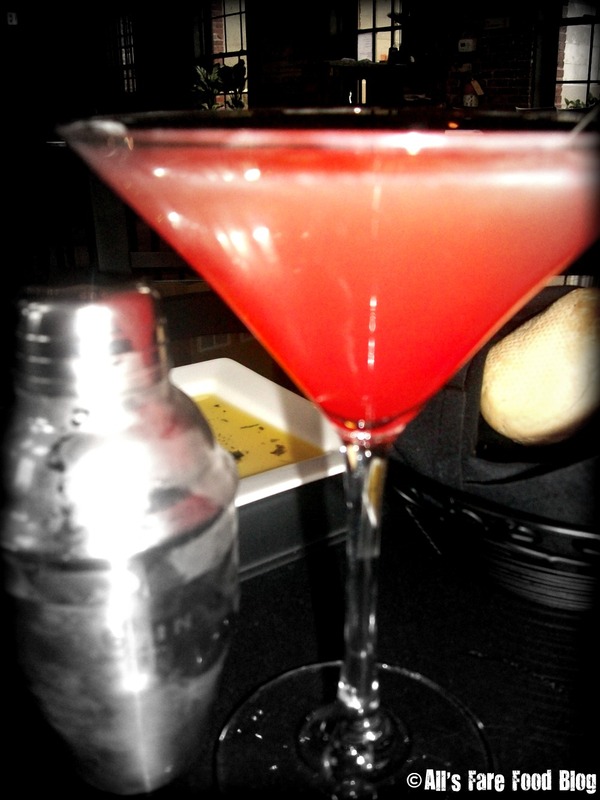 For starters, I ordered one of their signature cocktails – the Pineapple Upside Down, a mixture of Captain Morgan’s rum, vanilla-infused vodka and pineapple juice. Yea, it went down a little too smooth. Careful! You don’t want to be carried away in ‘cuffs later. I loved that Matthew poured the drink at the table…and left the remaining remnants from the mixer. Since it was Restaurant Week, we each had our choice of an appetizer, entree and dessert. The Great Escape’s menu puts a twist on classic Italian dishes like fried eggplant, seafood cioppino and freshly-made pastas. View the full menu for Restaurant Week at The Great Escape. 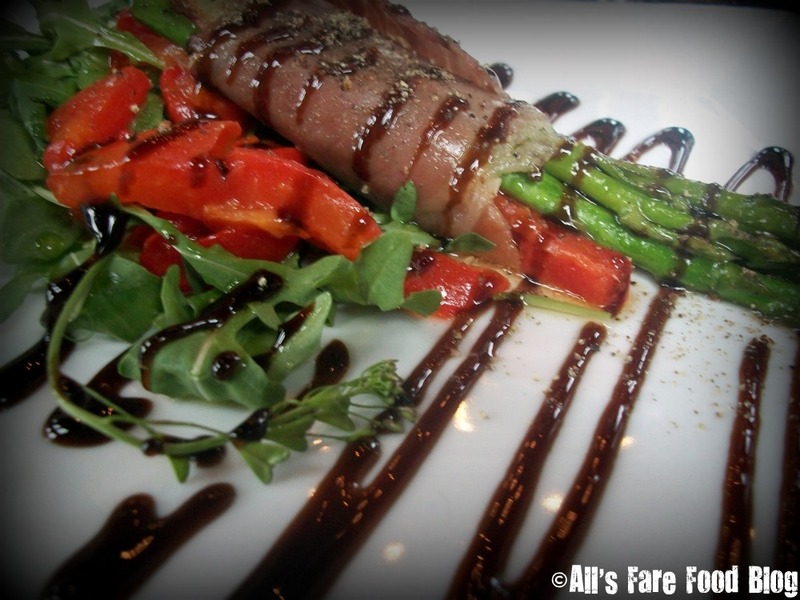 I started my meal off with asparagus served with roasted red peppers and smoked gouda, then wrapped in prosciutto and topped with a balsamic glaze. The dish was served on a pile of greens. It meant well but just didn’t hit all of its marks. The entire plate seemed too salty – with the cured prosciutto and the dressing. I also couldn’t discern any gouda. However, Brett’s app won the hearts of the parole board. 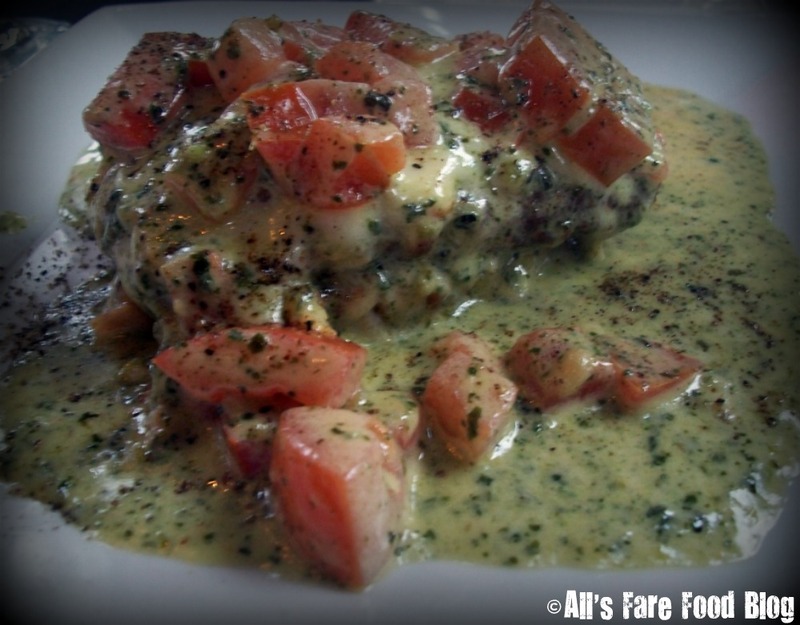 The breaded eggplant with prosciutto, ricotta cheese, tomatoes and a hearty pesto cream sauce was a pure delight. The prosciutto and cheese were breaded along with the eggplant, and then fried to a perfect crisp. 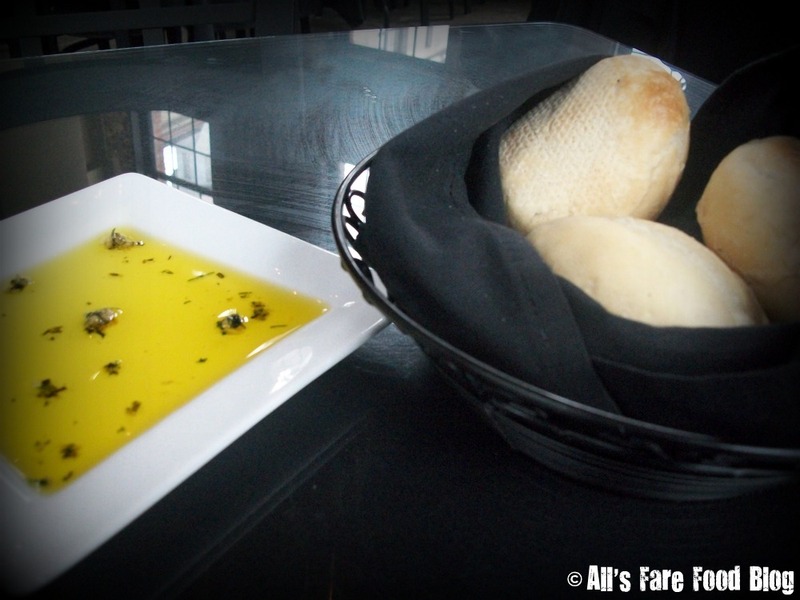 The pesto sauce paired perfectly with the complimentary rolls that each table received with a seasoned oil. The meal was nicely paced. Entrees didn’t come out as we were still finishing up appetizers. Our water glasses were constantly being filled, too. Plus, the waitstaff was delightfully engaging with all the customers. Already pretty full from the appetizers, we still had a second course – our entrees – to get through. 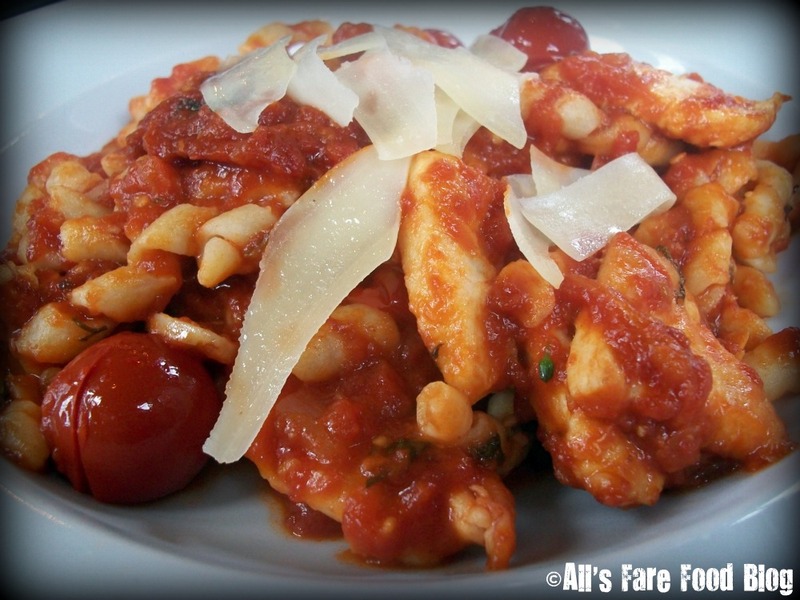 I enjoyed the homemade fusilli pasta with a tomato sauce and served with chicken and Parmesan cheese. The freshly-made pasta was amazing. I wish I could eat more of it. But, on the bright side, I have lunch tomorrow! Also, one of the great things about all the dishes – was the huge pieces of garlic. I love biting into a chunk of garlic in pasta or in salads. Now, if anyone wants to be near me later is a completely different story. 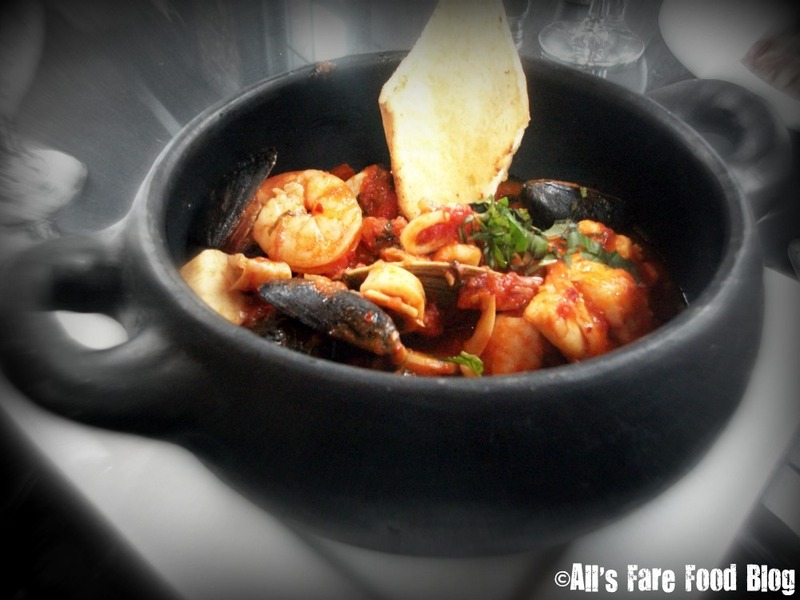 Brett’s dish – known as “The Mafioso,” is The Great Escape’s version of a seafood cioppino, or a seafood stew that finds its origins on the wharfs of San Francisco. Filled with mussels, shrimp, scallops, clams and other delicacies from the sea, the stew base was spicy, almost like a diavolo or arrabiatta. Plus, the serving dish was just beautiful. Need one of those for home. On The Great Escape’s regular dinner menu, The Mafioso serves for $24. We made up for the price of one of the Restaurant Week specials right there. Score! As if we weren’t full enough already, we still had our dessert course to go. Seriously, poke a fork in me. I’m done. This thing was AMAZING! I love dark chocolate – so this mousse, while it was fluffy and light, was filled with hunks of dark chocolate pieces and then piled like a cloud on top was a mound of fresh whipped cream and a strawberry. 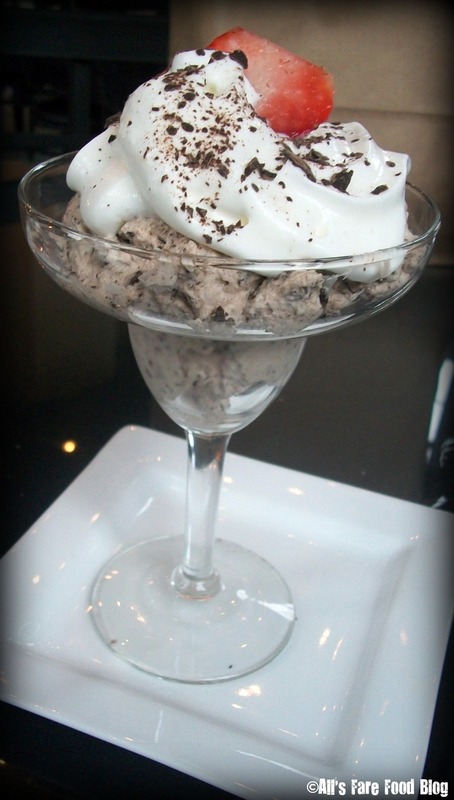 I would go back just for this dessert. 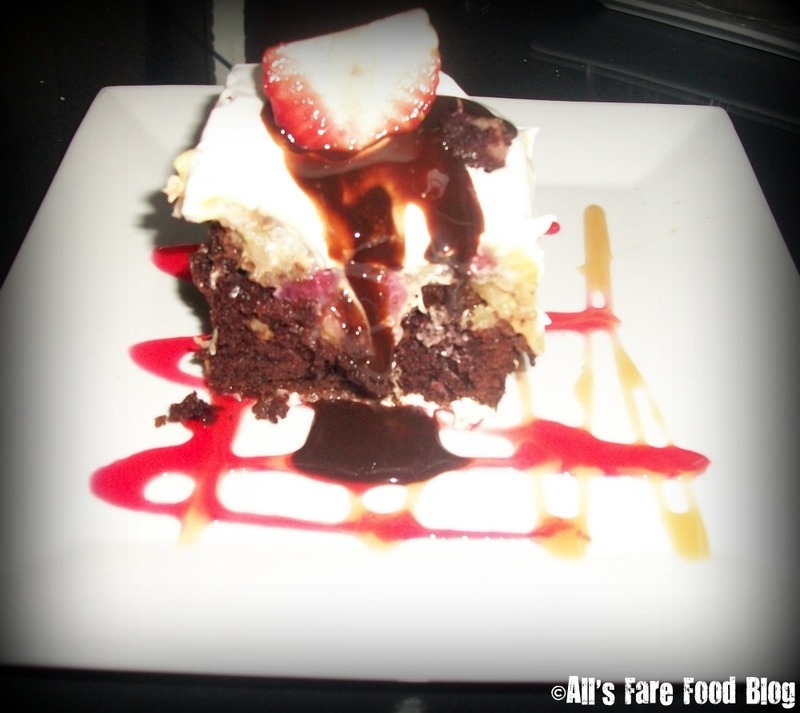 The alternative dessert choice for Restaurant Week was a strawberry, banana and pineapple pudding covering a slice of chocolate cake that is then topped in whipped cream and garnished with a strawberry. While a lot less rich than the chocolate mousse, the chocolate cake had a strange after-taste, almost like Kahlua but not quite. The fruit-pudding mixture seemed slightly thrown together without much thought. While the restaurant is still relatively new, I give huge props to head chef Fredie Barbosa and his team. There are certainly good things to come from this restaurant. It has a prime, downtown location, and the food is a nice alternative for North Shore residents who want some Italian cuisine but don’t have the time to travel to the North End. There is some outdoor seating, which during the summer months will be a great escape for Salem restaurant-goers, too. To learn more about The Great Escape, visit their website at http://greatescaperestaurantsalem.com. To find out more about Salem Restaurant Week, visit the Salem Chamber of Commerce’s website, where you can find all the participating restaurants and view their menus. This entry was posted in Cuisine - Italian, Cuisine - Seafood, Places - Massachusetts, Places - New England and tagged Bridge Street, Captain Morgan's, cioppino, commuter rail, desserts, dining, Fredie Barbosa, historic buildings, Italian, jail, kahlua, martinis, MBTA, outdoor seating, pasta, postaweek2011, prison, prosciutto, review, Saint Peter Street, Salem Restaurant Week, seafood, The Great Escape, vodka by Christina. Bookmark the permalink.